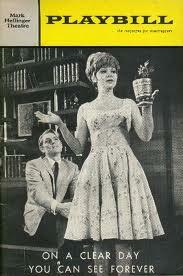 “On a Clear Day” is from the 1965 Broadway musical On a Clear Day You Can Forever, which starred Barbara Harris and John Cullum. The story concerns a young woman who remembers her reincarnations while under the care of his psychiatrist, played by John Cullum. The production received mixed notices, save the wonderful score by Lerner and Lane. “On A Clear Day” was recorded on August 11, 1970 and released that year on the album Tony Bennett’s “Something”. It was arranged by Peter Matz.